TFleas are insects that are wingless, with mouthparts adapted for piercing skin and sucking blood. Fleas are external parasites, living off the blood of mammals and birds. Fleas and ticks tend to become active when the weather warms up in the spring, and it can be difficult to keep them out of your home. The best way to rid your house of fleas and ticks is to use a multi-pronged approach: do a deep cleaning, treat your pets with flea and tick repellent, and treat your home with a chemical application. For the best results, dedicate a day to doing everything at once. 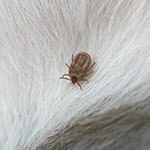 Pest-Pro Specialists can come periodically to monitor your home and help prevent an infestation of Fleas/Ticks.